The bloodroot flower resembles a water lily and has 8–16 white petals around a golden yellow centre. There are two sepals that fall as the flower opens. The plant’s large, round leaves have several deep lobes. Bloodroot gets its name from its underground stems, also called rhizomes, that contain a red juice. This also inspired its Latin name, Sanguinaria, which means bloody or blood red. 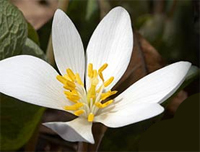 Habitat: Bloodroot’s natural habitat is in or at the edge of rich, moist woods. Bloodroot has separate stems for the flower and the leaf, and it reaches an average height of 10–25 centimetres at maturity. In April or early May, the bloodroot flower bud appears, wrapped protectively inside the leaf. As the flower opens, so, too, does the leaf. When the snow starts melting and days grow longer, I am eager to go walking in the woods. The earth smells of spring, the birds are full of song and the forest floor is carpeted with spring flowers. Wherever there are stands of deciduous trees — trees that lose their leaves for the winter — there is the possibility of finding the delicate blossoms of spring ephemerals. Spring ephemerals are flowers that make the most of the light that shines down through the open canopy in early spring. It is at this time that they bloom and reproduce. Then they quiet down by late spring when the leaves are fully sprouted on the trees overhead. While some flowers are easy to see, others require a slow pace and a keen eye to spot. I have discovered untouched areas blanketed with the fresh white of showy trillium or with the less noticeable, but equally lovely, trout lily. Once your eye gets used to spotting these spring flowers, you will notice them almost everywhere! One impressive spring ephemeral is bloodroot (Sanguinaria canadensis). This member of the poppy family has a short blooming period, but it puts on a good show to make up for that. It also has large green leaves that persist through the summer, serving as a useful ground cover. The roots of bloodroot are extremely poisonous although North American Indians have used it for medicinal preparations and as an insect repellent. The red juice from the plant has also been used as a dye for clothing and for decorating skin, various tools and household items. According to Mary Predny and James Chamberlain, authors of Bloodroot, Sanguinaria Canadensis, An Annotated Bibliography, research is being conducted about the use of bloodroot as an animal feed as well as a pesticide. Caution: We are not recommending the use of these plants for medicinal or food purposes. Many plants are poisonous or harmful if eaten or used externally. The information on food and medicinal value is only added for interest. This information has been gathered from books and its accuracy has not been tested. Seeds typically ripen a month after flowering. It is best to plant seeds at this time to give them a natural period of several weeks of cold and then several weeks of warmth for germination. If you are collecting the red-brown seeds from your own plants, watch the pods carefully because once they start to split, the seeds will disperse quickly. Bloodroot prefers its natural habitat of rich soil under deciduous trees and shrubs. It thrives in deep shade or partial shade with gentle, early morning light. But if you keep the soil moist and well drained, the bloodroot plant may be able to handle more sun. Applying leaf mulch helps to imitate the conditions found in the forest and provides nourishment as the leaves decompose. Leaf mulch also offers protection during the cold northerly winters and the drying summer heat. Refrain from mulching too heavily, however, as this can contribute to stem rot. Growing native plants can save time and money, and be rewarding for both humans and our wildlife neighbours. Learn more about growing native plants in your garden. To find a native plant supplier near you, try our list of Canadian nurseries.